THE HEAD OF the Eurozone bailout fund – the ESM – has played down the chances of Ireland securing retroactive direct recapitalisation of AIB and Bank of Ireland. The Government had been hoping to unload the debt from the two lenders from its balance sheet, despite strong objections from other members of the currency area. During the summer, Eurozone finance ministers agreed to consider retroactive recapitalisation on a case-by-case basis — a move seen as a positive step in Ireland’s bid to recover the costs it has already run up by bailing out the two banks. However, any such decision would require backing from all seventeen Eurozone nations. “Member states of the euro area have said that [moving the government's stakes in bailed-out banks to the bailout fund] will be either difficult or impossible,” ESM Managing Director Klaus Regling told the Wall Street Journal today. 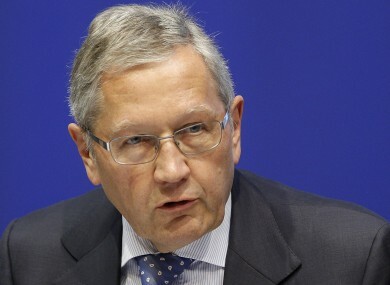 According to the paper, Regling stressed that this didn’t mean the fund wouldn’t be able to inject capital directly into ailing banks in the future — but he said that Eurozone countries that contribute to the ESM are concerned about using the option for problems arising from past crises. Email “ESM chief: Recouping of AIB, BoI costs "either difficult or impossible"”. Feedback on “ESM chief: Recouping of AIB, BoI costs "either difficult or impossible"”.